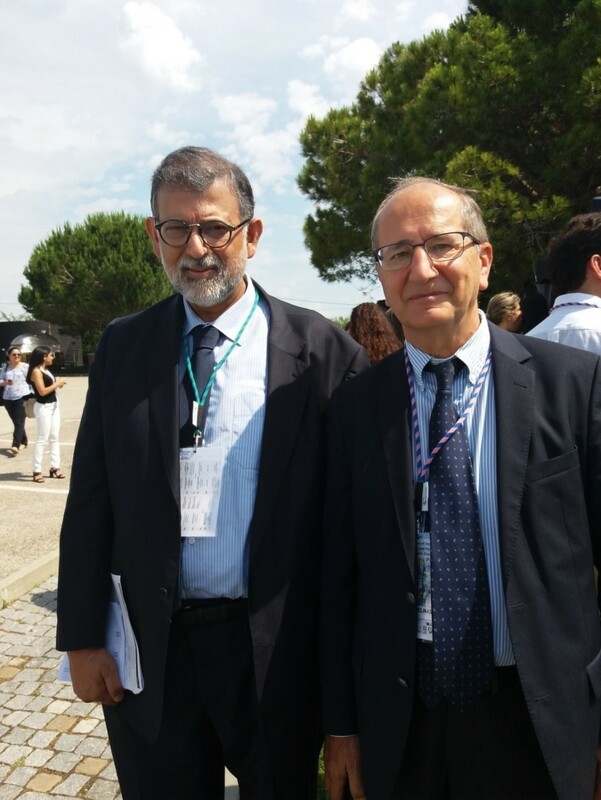 Professors Vincent Delmas and Ivo Furtado, in a moment of pause at the Congress. The 3rd World Congress of the UNESCO Chair in Teaching and Research in Digital Anatomy, Paris Descartes was held on 21 and 22 of June 2018, at the Egas Moniz University Institute (IUEM) Campus, at Monte de Caparica (Almada). At the invitation of the IUEM Board, its Department of Anatomy and the Executive Committee of the 3rd World Congress of the UNESCO Chair in Teaching and Research in Digital Anatomy Paris Descartes, the Institute of Anatomy of the Faculty of Medicine of the University of Lisbon was represented by Professor Ivo Álvares Furtado, Associate Professor with Aggregation in Anatomy, simultaneously in the capacity of President of the Portuguese Anatomical Society, who gave a lecture entitled “Paths for Anatomy Education in the Digital Era – Options of the Institute of Anatomy of the Faculty of Medicine of Lisbon”. He called attention to the excellence of Anatomy teaching at the Faculty of Medicine of the University of Lisbon, to student integration in the teaching-learning process and also to the role of digital technology in the teaching of anatomy, which must be considered in light of different realities, aiming for a high level medical education. He presented 3D models developed at the Institute of Anatomy, with the objective of forming pedagogical material for Anatomy students at the Faculty of Medicine of Lisbon. He manifested the availability of the Institute of Anatomy of the Faculty of Medicine of Lisbon, for the establishment of international partnerships aimed at the dissemination of knowledge regarding these new resources, which will allow for a more effective teaching of Anatomy. The event, which was attended by renowned International Speakers, met its main objective of bringing to light the current scientific and technological work being carried out by several regional partners in Europe and South America. The event was chaired by Professor Vincent Delmas (Professor of the Chair of Digital Anatomy of UNESCO), who addressed the topic “Human Anatomy in the 21st Century”. Other lecturers included Professor Jean François UHL (Université Paris Descartes), Guillermo Prat and José Alberto Ovelar (Universidad Nacional de La Plata), Julio Cardenas Valenzuela (Universidad de Chile) and Ismael Herrera (Universidade Nacional Autónoma de México). Interesting addresses and posters were presented, highlighting not only the objectives of improving the teaching of Anatomy, but also aiming for a more effective surgical training and more effective anatomy-based therapies, namely in the field of surgical oncology of resection, or of sectorial embolization. Highlight to the lectures of Professor Dr. Luc Soler on “Augmented Surgery: from medical image to computer assistance”, Doctor Professor Odile Plaisant, with the title “Online Interactive Digital Dejerine’s Atlas” and Doctor Professor Jean François Uhl, who presented the topic “Building a 3D vectorial atlas from a set of anatomical slices”. Lastly, it was decided that the next Congress (4th World Congress of the UNESCO Chair in Digital Anatomy) will be organised by Professor Ismael Herrera (Universidad Autónoma de México), from September 30 to October 4, 2019 in Mexico.